. . The Safariland Model 6280 holster is the base model of Self Locking System (SLS™) series of holsters. It includes a unique rotating hood design. 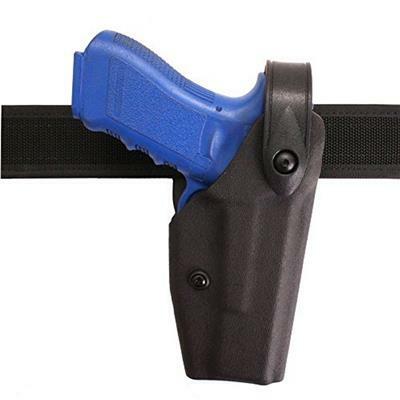 This. . holster also features a Universal Belt Loop that mounts on a 2" or 2.25" Duty Belt. With no snap, the Safariland 6280 holster’s SLS™ design allows for a. . smoother single-motion draw and greater protection against attempted weapon takeaways. The hood can only be released by being simultaneously pushed down. . and rotated forward and actually becomes more secure when upward force is applied. It is also far less likely to release accidentally than conventional. . thumb break snaps. The 6280 holster features a tensioning device, which, when firmly adjusted becomes a Level III Retention™ holster.. . SLS (Self Locking System). . Mid-Ride position allows for excellent weapon protection and quick easy draw. . Top draw and straight drop cant. . For pistols or revolvers. . Level III with optional Sentry installed or tension screw properly adjusted. . Level IV with optional Sentry installed and tension screw properly adjusted. . Available Plain Black, Basket Weave, Hi-Gloss, or Nylon Look finishes. .